01 « April « 2014 « Nothing in Biology Makes Sense! When I first heard about Twitter (several years before I actually understood what it was) – I remember thinking it sounded silly. Who cares what celebrities are thinking (Figure 1)? I dismissed everything Twitter-related as irrelevant and continued on my merry way. I think it was during Evolution 2011 that Jeremy (from this blog) suggested I join Twitter because you can follow interesting talks and remain engaged throughout conferences. It took a little while for me to work up a real affection for Twitter but the longer I’ve been a member (and perhaps the longer Science and scientists have had to assimilate it into our work world), the more useful I find it (Figure 2). Figure 1: An example of the “Why bother?” side of Twitter. And why 103,000 people bothered repeating this via “retweeting” is beyond me. It gets dumber each time I read it. Figure 2: Why you actually should bother. 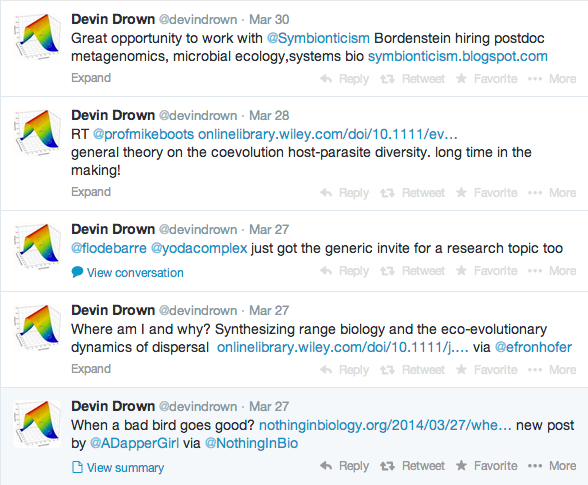 Devin’s posts include (top to bottom) – passing along a job opportunity, interesting publication, a professional interaction about science spam, a second paper and link to our blog! Regarding social media and scientists in general, Bik & Goldstein have written a great introduction. They discuss the pros and cons of several platforms (i.e., blogs, Facebook, Twitter) and how to choose amongst these depending on your interests. For example – are you most interested in communicating science to the “general public”? TO THE FLOW CHART! Perhaps creating your own content in the form of a blog is for you. Alternatively, are you more interested in compiling cool stuff you’ve found from across the world wide web? Consider Facebook. Despite the ubiquity of social media in our world, many scientists are reluctant to embrace it. That’s somewhat understandable – “Why bother?” is an easy question to ask and get no answer to if you’re “unplugged”. Bik & Goldstein outline four major “research benefits from an online presence”.